When it came out, the DJI Inspire 1 was a marvel of drone tech. It was a drone with high-end features, and it offered the possibility of changing the cameras, which was unseen on a drone before. For the first time, cinematographers were able to choose different lenses, depending on their shooting needs. The Inspire 1 is still considered as one of the best drone models on the market. But, the mentioned market had evolved, and the Inspire had to evolve as well. Therefore, the house of DJI decided to create the Inspire 2. Even though at first glance, the two Inspires’ look pretty much the same, they are actually very different when it comes to what’s under the hood. The Inspire 2 has an improved obstacle avoiding system, therefore it is even safer and easier to fly, it is compatible with newer, better camera choices, like the 5.2K Zenmuse X5S, and the airtime and overall stamina is increased because it uses 2 batteries. The only downside to this new tech wonder is that it costs a pretty penny and that it doesn’t come with a camera included, which means the final price is even higher. 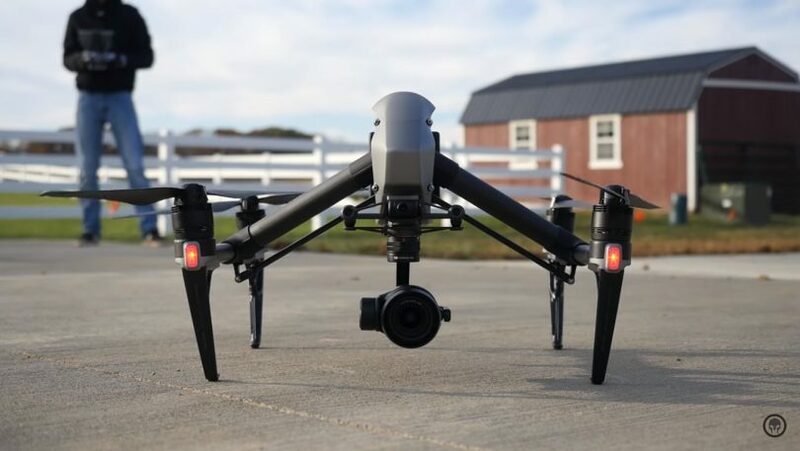 However, for serious cinematographers, the final price-tag is definitely worth it because the Inspire 2 brings a whole new era to aerial cinematography. 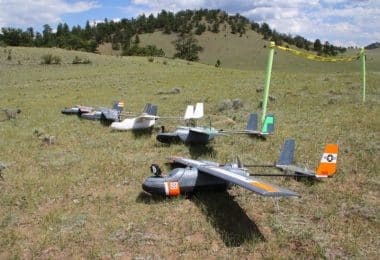 Now, let’s get deeper into what this drone can do and what makes it tick. Let’s have a look at what makes the DJI Inspire so special and why does it have an advantage over pretty much every other drone on the market. As you can see, the standard package includes just the essential things you need to get airborne and there’s no camera (other than the inbuilt FPV, which is used for seeing where the drone flies, not shooting footage), there are no spare batteries or a carrying case, and there is no second remote controller for the camera operator. If you want to get all of the mentioned, you will have to “cough up” an additional grand or grand and a half. Those who recognize the Inspire 1 will have a hard time realizing that what they are seeing in the air, is actually the Inspire 2, not 1. Until they get close to it, that is. They might seem identical, with the same body design and the carbon-fiber arms, but, for starters, the shell material is not the same. Unlike the I1, which had a white plastic shell, the I2 has a super modern magnesium/aluminum housing which makes it even tougher. Also, the I2, as I mentioned above, comes with an FPV camera that is paired with obstacle avoidance sensors on the sides. And, at the back end, there are now two batteries, for an improved flight time and a more stable powering of all the additional electronics. The end result? Well, now it looks even more like something that came out of space and is here to investigate our planet. But, let’s talk more about how safe to fly this drone actually is. Even though the only damageable parts of the drone are the props, which are not that expensive to replace, and the camera (which would really be a considerable blow-back considering the price), DJI has made it pretty much impossible to crash thanks to all the electronics and sensors that keep it out of harm’s way. The FPV cam I mentioned, alongside the two sensors on its sides, is in charge of preventing the drone to hit anything that is in the range of 30 meters in front of the drone. 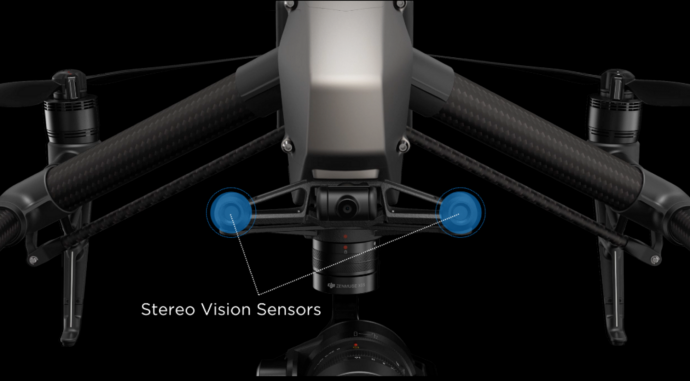 Furthermore, the Inspire 2 also has infrared sensors on top, so that the drone doesn’t hit anything that is in the range of 5 meters above it. And, as if all that wasn’t enough to make this drone pretty much a flying ace, DJI decided to add more sensors on the bottom of the aircraft, so that it can detect the changes in the terrain, and prevent the drone to hit the ground. As you can see, the Inspire 2 is capable of avoiding trees, buildings, and pretty much anything else in its forward flight path, or above or below it. But, I have to also let you know that once the full avoidance system is on, the speed of the drone will be limited to 45 mph. However, don’t let that discourage you because once you get used to flying it and become more secure, you can turn off all the safety features, and hit the speeds of 58 mph. Unfortunately, the standard package doesn’t come with a filming camera. But, it is compatible with a wide range of Zenmuse models. The current best camera option is the large, Super35 sensor X7, and it’s every filmmaker’s dream drone camera. This cinematography wonder can shoot 6K RAW videos, @30 fps, in Cinema DNG format! If that is for some unexplainable reason too much for you, you can shoot in 5.2K @60 fps, in Apple ProRes, in either HEVC (h.265) or h.264 format. This will allow you to save some hard drive space due to a much better compression. If the X7 camera is out of your price range, you can opt for a more affordable model, yet by all means not a mediocre camera, the X5S. This Micro 4/3 camera has been developed together with the Inspire 2 and especially for it, and, it is a much better model than the ones that are compatible with the Inspire 1, the X4S and X5R. Besides a bigger sensor than the previous models, the 20.8 MP X5S captures much more details and offers an improved color sensitivity, as well as a better noise reduction. When it comes to resolution, the X5S delivers 5.2K footage @30 fps or 4K @60 fps. Another great thing about this camera is that it’s compatible with any lens from the 18-90mm range, which gives you an array of shooting possibilities. Furthermore, if you really want to exploit the full capabilities of this camera in combination with the Inspire 2 drone, you can opt for additional gadgets such as a long-range focus controller and a dedicated hard drive specifically developed to hold X5S footage, with a memory capacity of 480GB. So, as you can see, when paired with the Zenmuse cameras, the Inspire 2 truly becomes a filmmaker’s dream and opens up unseen before possibilities. Now, when it comes to the battery (in this case, batteries (plural)), the life of the cells has been significantly improved. The old Inspire had a relatively short flight time of around 15 minutes per battery, whether we are talking about the standard or the Pro version. With the Inspire 2, the factory specs claim it’s 27 minutes, but in real life scenario, that comes down to some 25 minutes of just hovering, or a minute or two down, depending on your flying style, the amount of wind, and if you are using all the obstacle avoidance systems. When it comes to how much time the batteries need to charge up to 100%, if you are like me, setting the drone down after the first low battery beep, you will have to wait for an hour until your battery is fully recharged. On the other hand, if you like to squeeze every last drop of power from the battery and wait till the drone lands on its own, the recharging will set you back some hour and 20 minutes to an hour and a half. Like with its older brother, the I1, the I2 also has a dedicated remote controller with a powerful transmitter. Unlike the Phantom 4 Pro, the Inspire 2 doesn’t come with a dedicated monitor so that you have a live feed of the flight. This means that you need a smartphone or a tablet, Android or iOS, and you need to install the DJI GO 4 app. The app itself is pretty intuitive and allows you plenty of things. For example, you can switch the beginner mode, choose the smart flying modes, such as the Spotlight Pro (for tracking objects that are moving and keeping the camera on the object all the time), adjust camera settings, and a few more things. 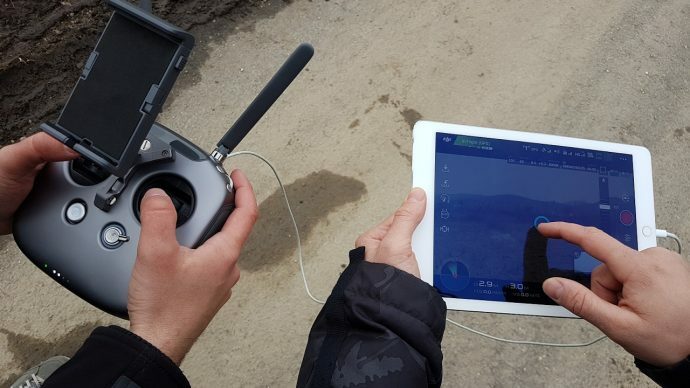 Now, if you want to unlock the full filming potential of the Inspire 2, you will need a second remote for the camera operator why you focus on flying the drone. But, that will set you back some $550, and you will need to stay within 100 meters from the camera operator so that you both have a video feed. As a matter of fact, staying right next to the camera operator is highly recommended because flying like that, in tandem, requires constant communication. Being a high-end drone (the highest-end drone actually) all you can expect from the Inspire 2 is perfection when it comes to flight performance. Once in the air, it is unbelievably stable and while flying, it’s like it’s running on tracks. You know how best modern 4-wheel drive cars feel while driving, like it, simply cannot slide or slip, well that is the feeling you will have with this drone. Now, if you have all the safety systems on, the highest cruising speed you will be able to achieve is 45 mph and it will feel like a flying fortress. On the other hand, if you want more speed you will have to switch to Sport mode, which means the max speed of nearly 60 mph, with the wind in the back, but without obstacle avoidance systems on. And, in this mode, the stopping distance is significantly longer, so you will need to break much sooner. As for the max control distance, without any interference, you can expect up to 7 km, and the same for the video feed. But, in real life conditions, there’s rarely any no-interference zones, which means that the range you should expect is closer to some 4 km. But, even that is more than enough for any type of project you have, right? The Inspire 2 is undoubtedly the best cinematography drone of today, therefore, the price is quite high. For the drone, one controller, two batteries and a charger, you will have to cash out around $3K. And, we all know that the Inspire 2 is not meant to be used to just cruise around in FPV (racing drones are meant for that), meaning you will need a camera for filming. This, in case you are a really serious cinematographer, means getting the Zenmuse X7, which is slightly over $3K. And, an additional controller for the camera, which is some $500 more, and the final price of the drone goes to around $7K. But, considering that the Inspire 2 is a drone that weighs just some 4 kilograms with the both batteries and the camera on, and delivers better quality footage than many other much more expensive and heavier filming rigs, the price is actually a bargain, even if it sounds quite expensive. 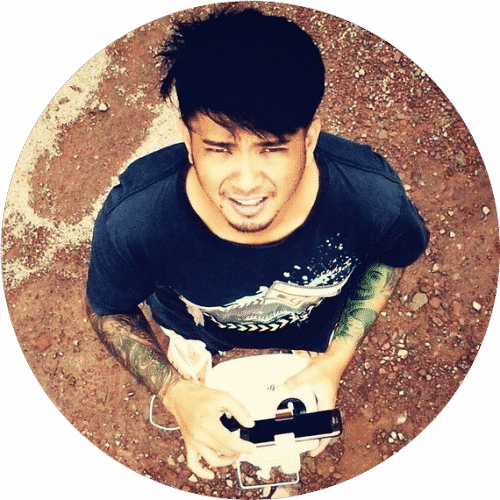 And, since it is an expensive filming tool, getting the DJI insurance is highly recommendable, despite the fact that they gave their best to make this drone uncrashable. Better safe than sorry, right? 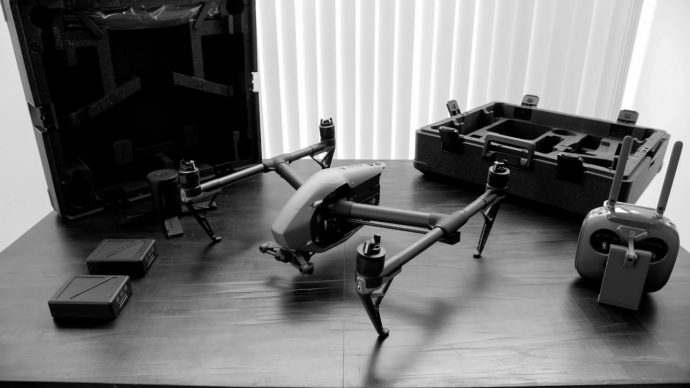 When it comes to having something no other drone has, in the Inspire 2 case, it is the Spotlight Pro feature. This is an advanced visual tracking algorithm (or at least this is how DJI explains it), and it is in charge of “sticking” the camera to the desired object like no other drone before. Sure, the follow me and similar tracking features and modes started showing up ever since the Phantom 3 series introduced them, but with the Inspire 2, DJI has raised the level of tracking to unbelievable heights. The Spotlight Pro is used in the intelligent modes that come with the Inspire 2, and it pretty much makes the camera controller needles. 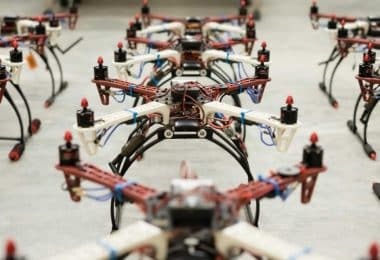 However, these “autonomous” camera modes, combined with flight modes, are mostly for tracking objects or subjects, and cannot replace an experienced camera operator in many situations. So, if you are serious about making movies or high-budget videos, you cannot rely on intelligent modes to get all of your job done and you will need a camera controller as well. The time has come to see which are the similar models that are worth comparing to the Inspire 2. Logically, the first one to compare it with is its older brother, the Inspire 1. 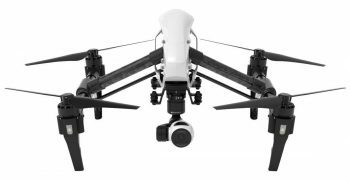 When it came out, the now iconic, the DJI Inspire 1 made a boom in the drone world, as well as in the world of professional cinematographers. It was capable of shooting in 4K, had an unbelievable range and great features and intelligent modes, and you could use its camera on a handheld gimbal. For high-quality ground shots. However, it still lacked characteristics that would make it a professional filming rig. In fact, it was more of a Prosumer than a Pro drone. 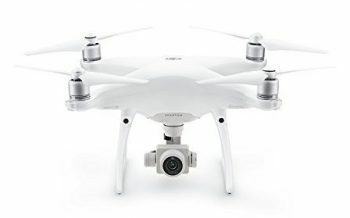 Sure, it had the ability to control the camera with a second controller so that the pilot would focus on the flight while the camera operator could focus on filming, which was unseen before, but the camera was not better than the Phantom 3 Professional, the flight time was just around 15 minutes, and the price was actually somewhat high for what it offered. The bottom line is that the Inspire 1 is a drone that is a great option for those who are looking for a bigger, faster, and greater range drone for aerial filming than the Phantom Series. 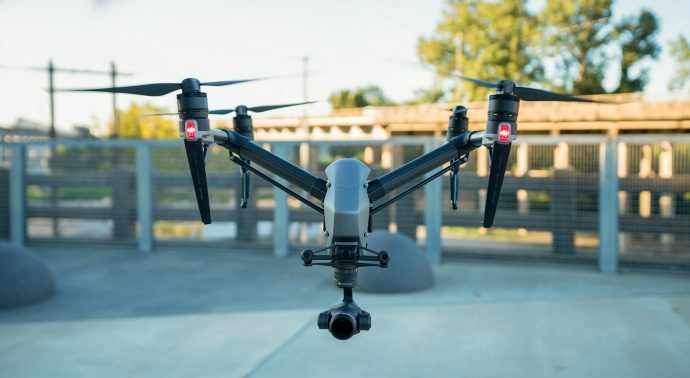 However, if you are looking for a drone that can carry a mirrorless compact or DSLR, and deliver cinematographic footage worthy of a big screen, the Inspire 2 is a logical choice. 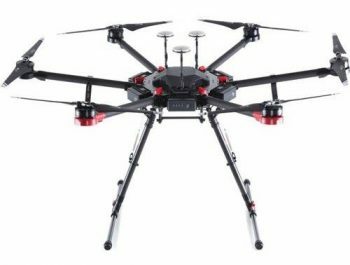 The DJI Matrice 600 is is a drone that offers the users a chance to choose the filming equipment they want to use and not rely only on one system. 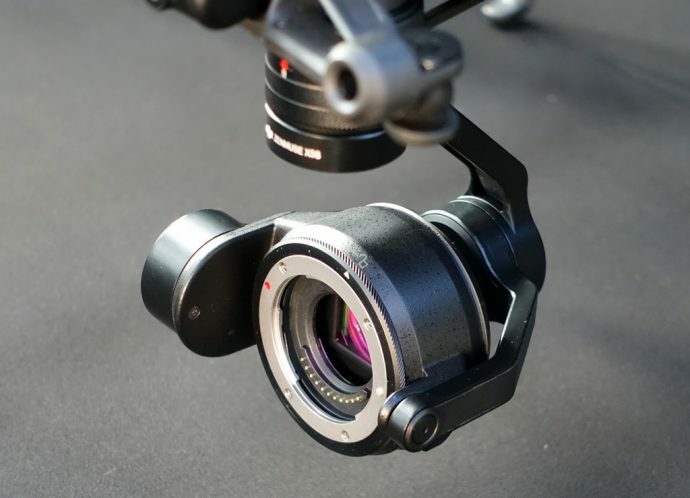 The drone is really powerful and capable of lifting heavy payloads and is compatible with the Zenmuse gimbals and cameras (except the X5S and X7, which are reserved for the Inspire 2), as well as third-party cameras DSLRs and mirrorless cameras. The Matrice’s “brain” is the famous A3 flight controller, and it also has the Lightbridge 2 system that streams Full HD live video feed. It also gives the option of using the same tandem flight tactics like with the Inspire 2, with two remotes and a camera operator besides the pilot. Furthermore, the six motor configuration and high capacity batteries are providing a quite admirable flight time. For example, with the X5R camera, the Matrice will stay in the air for 35 minutes. However, with a larger cinematic quality camera, the flight time comes down to some 16 minutes. Which is why the Inspire 2 has an advantage of being able to use the X7 camera. All in all, the Matrice comes as a great heir of the famous DJI Spreading Wings series, but is still behind the Inspire 2 when it comes to the overall price to usefulness ratio. The DJI Phantom 4 Pro comes as the next evolutionary step in the Phantom 4 series. It is not much different than the P4, yet, it has some significant differences that aren’t visible to the naked eye. Most of the features and components, as well as the design of the body, are borrowed from the original P4, but it comes with some upgraded and some new features as well. The most obvious addition is the more advanced obstacle avoidance system. The original P4 was capable of detecting obstacles only in front of it, while the P4 Pro can detect obstacles and avoid them, in 5 directions (bottom, left, right, back, and front). The second most important new feature is the camera. The P4 Pro comes with a camera that has a 1-inch sensor, shoots 4K @60 fps, and snaps 20 MP photos. In general, it has a bigger, and better camera than the Original P4, yet it’s light years behind the best choice you can have with the Inspire 2. One similarity that the Phantom 4 Pro has with the Inspire 2 is the Spotlight (not Spotlight PRO). As you might have guessed, it has advanced tracking algorithms, but not as advanced as the ones found in the I2. The P4 Pro will track the chosen subject no matter how and in which direction you fly the drone, but it won’t be as precise and persistent as the I2’s camera work. All in all, the Phantom 4 Pro is an amazing drone that can be used for professional purposes such as music videos, real estate, and plenty of other things, and it will deliver breathtaking footage. But, if you are looking for cinema footage that can be used for blockbusters, the Inspire 2 is in the huge lead here. 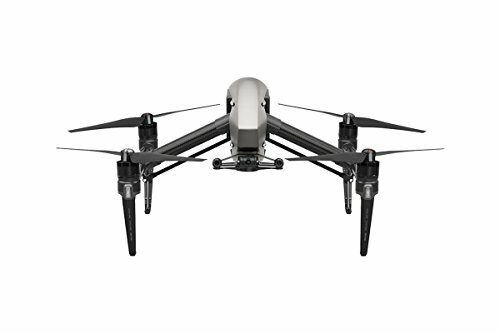 As you can see, there are many pros that make this drone the best on the market, and the fact that it doesn’t come with the included camera but you have to buy it additionally is not actually a con, but more of a selection of the final price of the package. 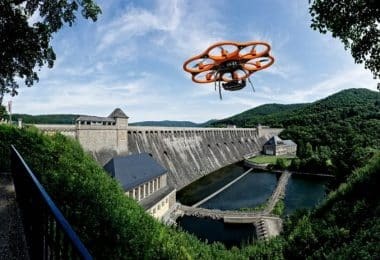 The price of this amazing filmmaker’s tool is probably out of the reach for most drone hobbyists, while it is affordable for productions or organizations. But, the full price with the best camera and all additional accessories, is actually a bargain for Hollywood movie companies and expect many movie scenes to be shot with none other than the Inspire 2. The new Inspire might just be the best flagship model that ever existed. It comes with the best safety systems on the market, has an amazingly durable design and build quality, an unbelievably functional app, and jaw-dropping optics, which can actually be upgraded as the time goes by, making the Inspire 2 a drone that you can use for many years to come. 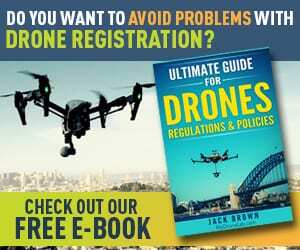 Thank you for reading and if you have any questions or want to share some of your experience with this drone, feel free to leave a question or a comment in the comments section below. And, speaking of sharing experiences, if you liked this review, that your friends can see what the Inspire 2 is all about as well.